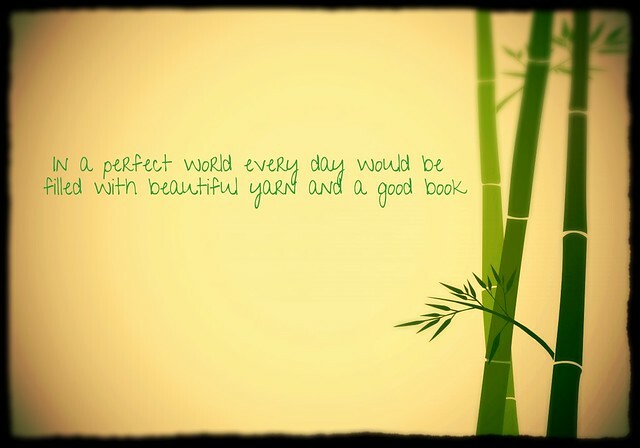 This week my WIP is a little magical. It is a shawl, but is a very magical shawl indeed. Sadly, it is not so magical that it knits itself. Nor does it knit up at a magical pace. And there is no guarantee that is will be the perfect size when it’s finished either. (Just for the record, I have never figured out exactly what the perfect size for a shawl is. It seems to be way too dependant on my mood.) It is magical because of the stripes. Those little colour changes are happening all by themselves in the right place and making perfect little sections. Now, before you start thinking that I have figured out the secret and am some sort of knitting wizard, it’s really not that at all. It’s the yarn. It’s all the yarn. The Yarn Harlot first blogged about it here and you can imagine what happened next. The yarn became a very scarce commodity. There were sell-outs, and back orders, and now it seems that scoring a skein of the magic yarn is the same as winning the knitter’s lottery. Somehow, my knitting guru managed to do just that and for Christmas a few of us received skeins. This past weekend I cast on the shawl. It says right inside the ball band, to be used with topdown triangle shawls. I checked Rav and the Caterpillargreen website and picked a pattern. I grabbed my 3.5’s and cast on. Four and a half hours later I was cussing the yarn and the dyer. I was oscillating between thoughts of auctioning off the skein and lighting it on fire in the courtyard. It was not going well. Colour changes were happening everywhere except where they were supposed to. I was miserable. I was frustrated. I was so very, very unhappy. 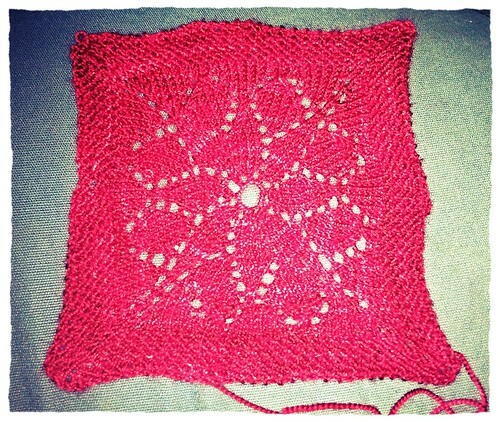 I had gone up and down needle sizes, tried a different pattern, added a second colour. Nothing was working. So I took to Twitter and posted my woes. Very quickly I received helped from another knitter. She pointed out that gauge is super important and to try again. So in one last ditch effort I went up another needle size. 4 mm way the key. They were the saviour for the shawl, and at that moment my sanity. It all started to work! It started striping by itself!!!! Now the shawl is flying off the needles. My goal is twofold. First I want to finish it this week so I’m ready for the weekend. (More about that on the weekend 😉 Next, I want to somehow win the knitting lottery when Caterpillargreen updates again. 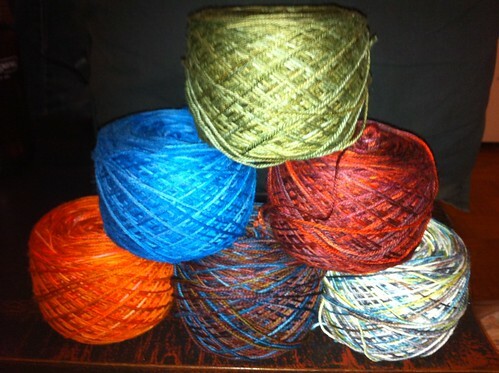 They have some truly beautiful colours just begging for me to knit with them. 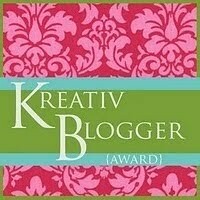 For more great stuff check out the Yarn Along at Ginny’s and KCCO at Frontierdreams. This week’s fibre is a little bit of a risk. Well maybe it’s not. It’s almost certainly, maybe, not a risk. Here’s the deal. I’ve started my SIL’S Christmas socks. The pattern is Lumberjacks. The pattern is not the risk. The pattern is awesome. This is my third pair in as many months. It’s great. The colour is fine. She’ll love red socks. The yarn is great too, but it’s also the problem. You see the pattern calls for a huge amount of yardage for each pair of socks. I’m not sure if it’s a difference in gauge, but according to the pattern I should need just over a skein of the master colour for a pair of men’s socks. As it turns out I need less than a skein. I fair bit less than a skein. So considering that I only used the red for the heels and toes for my hubby’s socks, and the ladies socks have fewer stitches per round and fewer rounds over all, I should need a much smaller amount of yarn than with the men’s socks. So I should have enough red yarn. It seems reasonable to think that. In fact it seems foolish to think anything else. I’m almost certain this will work. A yarn scale would make my life easier and happier. But that would require me to know where my scale is and right now I kind of sort of don’t. And anyway, it’s way more fun not knowing and having the anxiety spur me on. It will make me a faster knitter since we all know that if you knit super fast you will in fact avert a pending yarn shortage. But that’s not going to happen. I think. 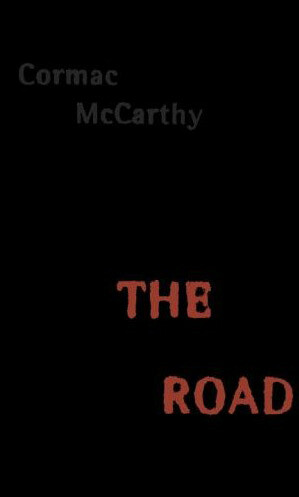 This week I finished The Road by Cormac McCarthy. As the story progresses you realize that it is, at its core, a very complex discussion on humanity and human nature. It asks the question, how do we retain our humanity in the face of insurmountable odds? Why do some people maintain a moral code of conduct that is reflective of current values, and others morph into something abhorrent? Or are do some people adapt while others cling to the past? It’s a fantastic metaphor for heaven and hell. It’s both brutally grim at times and uplifting in its depiction of a father and son’s unwavering love. I’m not certain I can recommend this book, but if you can deal with the writing style and very dark content it is worth the read. For more great Wednesday stuff check out the Yarn Along at Ginny’s and KCCO at Frontierdreams. I’ve decided that it’s time to break the spinning wheel out of its corner that it’s been sitting in since the end of November. This beautiful fibre was bought for me at Rhinebeck an d I did manage to un-braid it! So first I have to finish drafting it and then get it on the wheel. Wish me luck. My spinning always seems to suffer the agony of being neglected. While it is true that I am still reading the Lies of Locke Lamora, and still loving it, I have briefly put it aside to finish The Road by Cormac McCarthy. This post apocalyptic novel is a tale of the survival of a father and his young son that is simultaneously filled with enduring acts of love and downright brutal heartb reak and suffering. The rather abrupt writing style in the novel does add to the overall bleakness of the world in which the two main characters reside. Fortunately, in this case, a novel without a single wasted word works well. I think that an overly descriptive narrative would actually detract from the feel of the book and the fast and oddly intimate relationship that you form with the father and son. While I am not certain that I would recommend this novel, I can say that it is incredibly compelling. I feel like all I am writing about these days are the stars for the Holiday Garlands, or the squares for my Vivid Blanket. Assuming that these two projects end before my patience for them does, they will hopefully be off the needles very very soon (Yesterday, preferably). Then I can move onto something new. 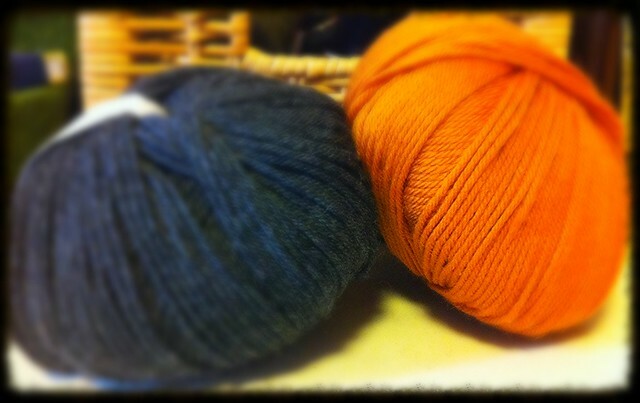 Mainly turning these two rather unassuming skeins of Cascade into a linen stitch scarf for my BIL. Normally this would not be a colour combo I would pick for almost anyone I know, but my BIL loves orange. I was concerned that orange and black would be way to Halloweeny for a scarf, so instead, with the help of one of my friends I picked this combo. I am relatively certain the results are going to be lovely and would really like to cast it on. I had the wonderful pleasure of starting off the 2014 reading year with this brilliant book. I admit that being a fan of Gaiman may cause me to be a little biased, however I do not think that can detract from what a wonderful read this is. Gaiman has once again combined being a wonderful writer with being an even better storyteller and has created a world in this book that engages and engulfs the reader. A true fairytale for adults, this is a fast and enjoyable read (in fact, my only complaint is that it isn’t longer), filled with memorable characters and a plot that keeps you hooked until the very last word. Additionally, the ending is outstanding. Fabulous from start to finish. I highly recommend finding a copy of this book and curling up under a blanket. It will be time well spent. For more great Wednesday stuff check out WIP Wednesday and the Yarn Along. This falls into the category of Oops! A few months ago on Ravelry I discovered the pattern for Vivid. For months I would log into Rav and somehow find myself staring at this blanket. I would check out other people’s blankets and think about making one for myself. Then I would remind myself that I have a very limited amount of knitting time right now, and that I really don’t need another blanket, and I would walk away. And then I would come back the next day and do the whole routine again. In May, I broke down and added it to my queue (so that way I could go and stare at it whenever I felt like it). And since then I have ignored it…..mostly. Until this past Sunday, when in a moment of weakness spurred on by exhaustion and a serious case of startitis I found myself downloading the pattern and digging through the yarn stash to find acceptable yarn. And then, in the blink of a knitterly eye there I was half awake on the sofa with the yarn on the needles and my first square cast on. OOPS!!!! And you know what? I love this pattern! I was a little concerned that I was nowhere close to getting the right dimensions, but a little bath in some hot soapy water and Voilà!! Dimensions achieved. Two little variations to the original pattern – it should actually have two more border rows but in my dreary eyed state I read “repeat the last two rows four times” and missed the “four times more bit.” Also, try as I might on Sunday, learning a new cast on method just wasn’t going well, and I gave in and opted to go with a long tail cast on. Each will be cast on the same way and I’m calling it a designer feature. 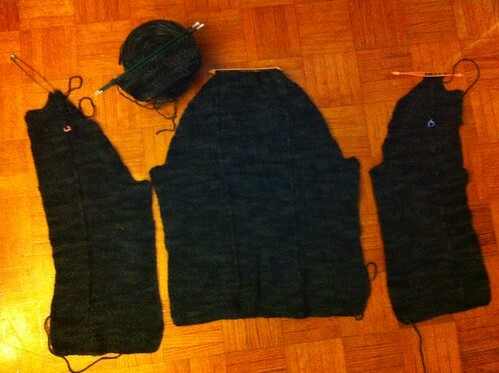 And…..the whole thing is being made with stash yarn!!!! This past week I was able to indulge in something I haven’t really been able to do for months. I got to read a book that wasn’t school related!!!! It really was a joy to read for pleasure again. And what I read was this. 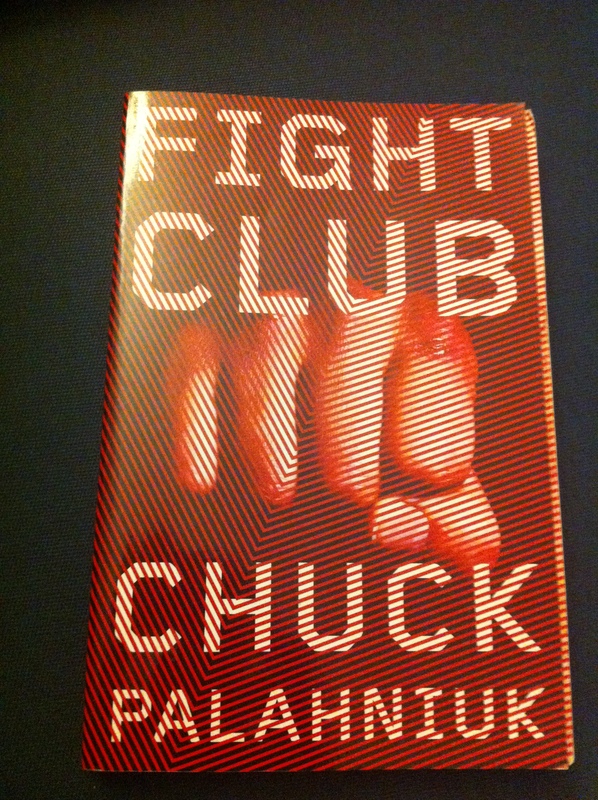 Yes this is the same book that is the basis for the movie Fight Club. First let me start by saying I love the movie. I think that it’s brilliant and well acted and I have watched it more than a few times. Reading the book has not changed my opinion of the movie at all. In fact, it has given me a whole new respect for the movie because I am not really certain how the directors managed to make something as streamlined as they did from this book. To point out, I think the book is a very enjoyable read and well written. But one could say it is, perhaps, a bit odd. However, if you enjoyed the movie give the book a go. You won’t be disappointed. And, in my humble opinion the book has a way better ending than the movie does. There is no denying that autumn is in the air. The nights are becoming blessedly cooler and the mornings are a little nippy. I even remembered to have my favorite autumn boots taken into the cobbler to be resoled. It must mean autumn in coming. I love autumn. In fact, if it didn’t indicate really scary things happening in the climate, I would love to oscillate between summer and autumn all year round. (I certainly could do without winter). I am also pretty sure it’s why Roam is suddenly back in my hands after a four-month rest. 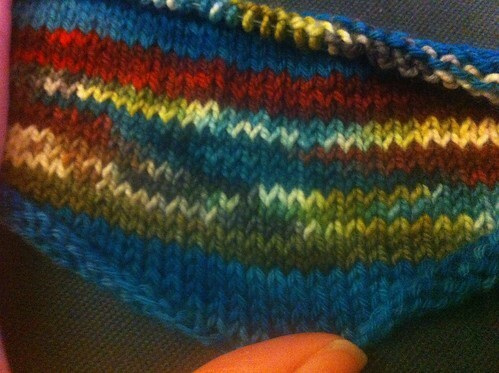 I suddenly really want to finish this little Cardi and I even want to start another one. I am blaming the cooler weather for this sudden turn of events in my knitting world. I suppose that there could be other reasons too, but those seem far less straightforward then a chill in the air, and these days I am all about straightforward. I have finished the “right front” section which means both the front and the back are finished and I have started the first sleeve. I am still relatively slow at moss stitch, so I don’t expect any big miracle finishes, but I am hoping to have the sleeve off the needles sometime this week, assuming of course that I don’t get distracted by something else. 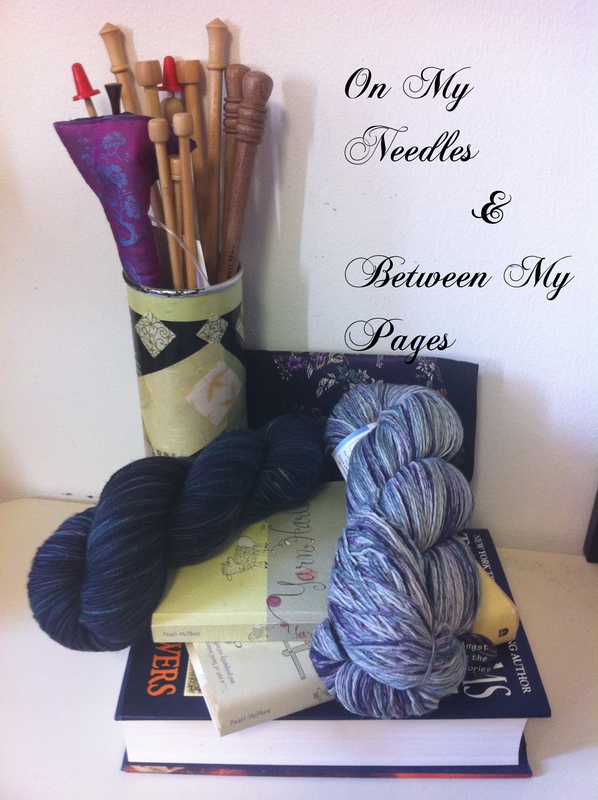 Hmmmm……Maybe I should change the name of this section from On My Needles to My Current Knitting Distraction. Normally I wouldn’t review a book that I have read for college. 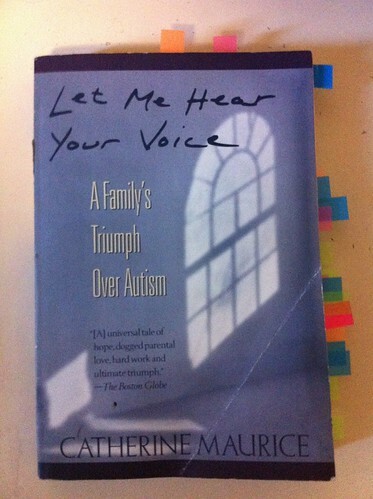 However, Let Me Hear Your Voice by Catherine Maurice is a wonderful book that provides insight about a one family’s struggle with the diagnosis of Autism not once but twice, in a time when Autism was even less understood than it is now. Written as a memoir by the mother, Maurice, it is unabashed and unapologetic about the emotional impact that the diagnosis has had on her family and friends, and the myriad of emotions that she has to struggle to deal with. This book is a valuable read for anyone who is interested in the subject or is struggling with these issues in their own lives. While ?? does repeatedly indicate that she can only write about her own family, and that what worked in their case may not work in all cases, there is still a great deal of wisdom between these pages. Note all the little tabs. Could be helpful for the assignment that I have to write based on the book. First I need to start this week by apologizing to my friend over at Twisted Stitcher because I fear that she will follow the pattern link and fall in love with the pattern the same way I did. Suzy, sorry if you end up wanting to add this to your list. My newest addiction is Turnagain. I love this pattern. I hate provisional cast on, so the 242 stitch cast on was a shade of a nightmare, but I did finish it and now it’s just going round and round. The colour changes keep it from getting boring and the knowledge that the ends will essentially be hidden in the finished work with very little end weaving is about as good as it gets for me. Just ask my Lizard Ridge blanket how long it takes me to weave in ends. I’m using five shades of Indigodragonfly yarn and one Waterloo. So I am in love and it’s all I really want to knit. But, since you all know that I have the attention span of a Hummingbird on hyped up on too much caffeine, you know that there is other knitting happening too. What can I say? I want to knit all the things all the time. Textbooks. Lots of textbooks with names like The Autistic Spectrum and Beyond the Autism Diagnosis. In reality, they are actually very interesting but it doesn’t make for a great book review. I do however, have some serious doubts about the last one entitled You and Others. I think that could be a bit of a chore.